Extra Large Sponge With 2-In-1 Cover. Scrub, Wash & Absorb. 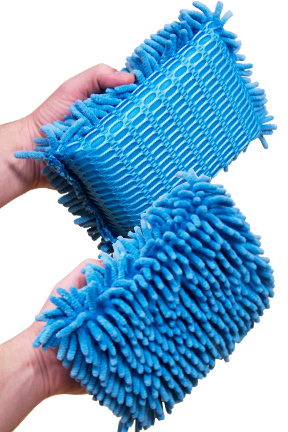 This extra large sponge has a dual sided cover to make it ideal for a variety of cleaning tasks. The interior consists of a super thick sponge material with high density. 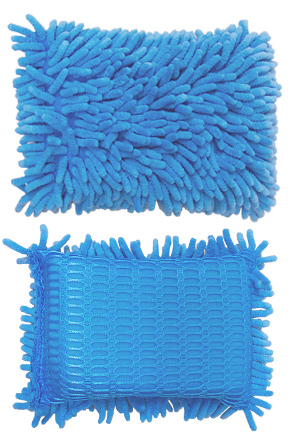 The outside is covered in high quality, chenille microfiber on one side, and a scrubbing mesh on the other. With this versatile cleaning tool, you will be able to dust, polish, clean, scrub, dry spills and more. Thanks to the combination of useful surfaces, this dual sided sponge will save you time, reduce effort, and enable you to end up with better results. It is safe for use on any surface, and it will not scratch or mark as you wipe. You can machine wash it when it gets dirty, and it is compatible with a variety of cleansers and soaps. For many jobs, this sponge can be used dry, or with just water alone to achieve amazing results. For other tasks you may want to use some sort of detergent or wax with it, and this would be acceptable. It is able to deep clean or remove dust without anything additional, but for jobs like scrubbing or waxing your car, you will probably want to use something with it. The Fat Fuzzy Chenille Mega Sponge is big enough to cover a large surface area with minimal effort, yet just small enough to be easy to handle. It is perfect for hand washing vehicles, but also useful for dusting your living room, wiping down counters in the kitchen, quickly drying spills in the bathroom and so much more. This is the fluffy, shag-like side. This side of the sponge can be used wet or dry, and is the most versatile surface. When dry, it is great for dusting and polishing. Use it without additional sprays to remove dust and shine the dashboard in your car, or wood furniture in your home. 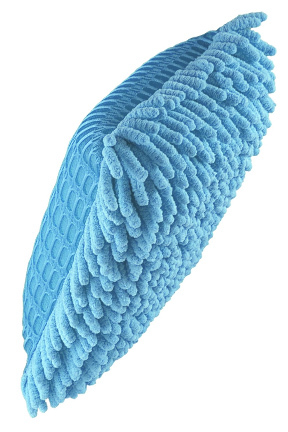 The chenille material has tons of surface area, and it builds up static as you use it. This means that dust and light debris will be sucked up like a magnet, and then locked into the fibers as you wipe. Because it is made from microfiber you will actual be able to polish as you dust, so surfaces will be left dirt-free and shining after you are done. Get this side wet, and you will be able to deep clean without harsh chemicals. It can be used on any surface safely, and the chenille fingers will cut through dirt, lift it up, and lock it into the fibers. These multiple protrusions also help to build a nice soapy lather when using the sponge with soaps and cleansers. Because this material is also very absorbent, when it is wrapped around a sponge, it creates a great tool for wiping counters or cleaning spills. This sponge will be able to soak up many times its weight in liquid and the chenille material will help to hold in moisture and prevent dripping. This side is all about scrubbing. The microfiber mesh is able to scrub and scour without being abrasive to the surface you are wiping. This means that it will cut through dried on dirt and stubborn grime without any risk of scratching. It will give you the power of an abrasive scrubbing pad, but will eliminate any fear or worry about what it might do to delicate surfaces. You will mostly use this side wet, and it is perfect for removing bugs from the exterior or your car. You can also use it to tackle stuck dirt and on flooring, countertops and more. If you are washing with this sponge and come across any dirt that wont wipe right up, just flip to the mesh side, scrub a little, and kiss it goodbye. The tough material will skim surfaces and scrub the dirt away. If you hand wash your car or truck, then this sponge is a must have. It will make it easy to lather and scrub the exterior, but is also useful on the inside too. Quickly dust and shine any interior surfaces without chemical cleaners. Dip it into the soapy bucket and create an amazing amount of suds as you deep clean the outside quickly and efficiently. You can even use it to dry things down afterward, and the material will eliminate moisture and allow the surface to dry without spotting or streaking. Whenever you come across a tough spot, simply flip the sponge over and let the microfiber mesh do all of the hard work for you. It will power through any stuck on debris, and allow you to continue on your way. As a household cleaning tool, this sponge can be a real asset. It is perfect for all around cleaning, and is so versatile that it would be hard not to get you moneys worth out of it. You can wash windows and mirrors, you can clean fingerprints from stainless steel appliances, you can dust TV screens and computers and so much more. Wipe down your kitchen sink, or dry the bathroom floor after the dog takes a bath. It can even polish wood and metal, or clean floors and walls. The thick sponge interior can hold loads of cleaner when needed, and it is able to absorb spills quickly when accidents happen. With the double sided cover and extra large sizing, this sponge is both easy to use and highly effective. You will be able to perform a number of cleaning tasks, and The Fat Fuzzy will make them easier and less time consuming. 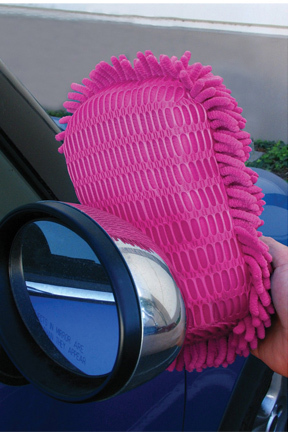 Simply grab this big sponge and wipe away for a quick and efficient way to dust, polish, dry and clean. Order Yours Today! Uses cleaning, drying, scrubbing, polishing, dusting, wax application, cleaning spills, etc. Dimensions (l x w) 9.5" x 6.5"
Fat Fuzzy Chenille Mega Sponge - An extra large sponge for cleaning and absorption with dual sided cleaning ability. A super thick sponge is surrounded by chenille microfiber on one side and a scrubbing mesh on the other. Order Yours Today! Does this come in a smaller version....say 7 by 4.5? At this time, no, there is not a smaller version available.